CLOSED: Thank you for all that took that time to enter and share little Emmaline’s photo and for following our blog. The winner has been selected for this give-away. Stay tuned for future updates. You can still sign up for blog updates to be sent directly to your email, so you don’t miss out on anything new. I love to do Giveaways! It’s a way for me to say Thank you to all of you who support my doll making and inspire me to create more. I truly appreciate the participation you have shown in our little dolly world. 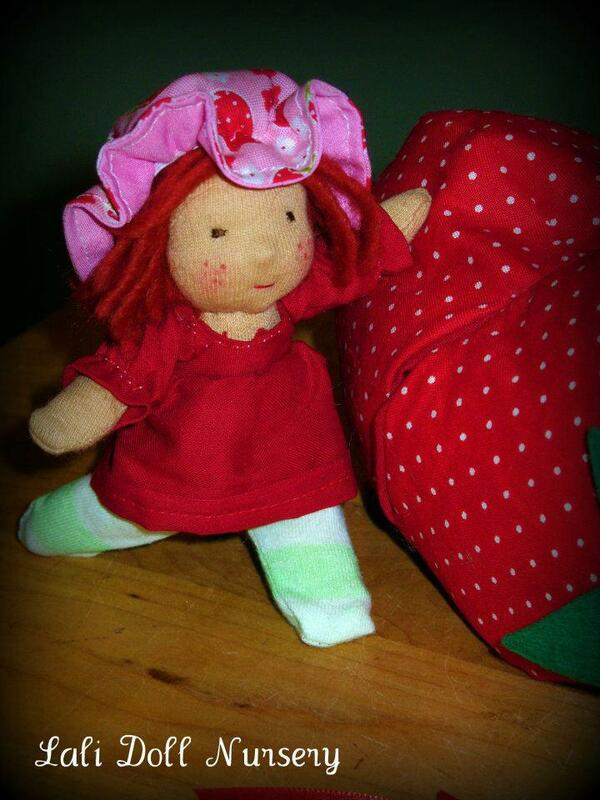 Each lovely comment you have shared has helped give me the motivation and inspiration for the next Lali Doll. Keep a watch on this page for updates on Giveaways. The giveaway we have going at the moment is in celebration of 2000 Facebook fans. The prize is a drawing for a the pictured doll Emmaline. To Enter the Contest, read below; There are opportunities to leave up to 4 entries. The only entry that is required is stated in #1 and #2 below. #’s 3-5 are voluntary for extra entries only. **Please only use one account to enter this contest, do not enter twice under different accounts, the blog records IP addresses and duplicate entries will be removed. If you have more than 4 total entries extras will be removed. 2. REQUIRED TO ENTER: Once you have subscribed to the blog, please leave a comment below stating that you are subscribed and would like to be entered in the drawing. (Make sure your email address is current, since that is how I will be contacting the winner). 3. You may have ONE extra entry if you share the photo of Emmaline from our facebook page here. Write another separate comment that you have also shared our facebook photo. (Make sure your sharing is “public” otherwise I cannot see that you have truly “shared” only public shares will be visible to me and if I cannot see the “share” on Facebook under your name, I would remove the extra comment here. 4. You may have ONE other extra entry for “Pinning” the photo of Emmaline from our Pinterest page. Leave another comment below to state you have done so. The winner will be announced when our Facebook page reaches 2000 fans. You can help speed that along by sharing with your friends! We are so close! The winner will be chosen via Random.org. Hi! I am subscribed and would love to enter your drawing. Your dolls are so adorable! I have now pinned her! Sooooo great! I am following and would like to be entered. I’ve tried to follow a few times and it would never let me, not sure why it did today. good news! and what a gorgeous girl to giveaway! Votre poupée est sublime…………. Que peut on dire de plus !!! J’aimerai tant votre savoir faire …. et si la chance me souriait , elle ferait une heureuse mamie avec une âme d’enfant ! Milles remerciement pour tant de finesse . I pinned her photo on Pinterest! Subscribed! I would love to win Emmaline. Thank you! I’m subscribed! Thanks for the opportunity! Subscribed to your blog. Thank you so much! She is beautiful! I am now following your blog. I agree FB is doing more and more weird things. Shared to my FB page! Pinned on Pinterest as well! Shared on FB. She is so beautiful…. I subscribed to your blog. Please enter me. I shared her picture on my FB. pinned her on my Pintrest page……. She is beautiful! I would love to be entered to win her! I followed Lali Doll Nursery blog! please enter me for a chance to win Emmaline! I’ve subscribed, we would welcome her with open arms and big smiles! Shared on FB as well. Delighted to be following you, Jennifer! Thank you for sharing this wonderful chance with us all. Repinned and shared on Facebook. Thank you for the opportunity to be a Lali Doll owner! I just tweeted about your amazing giveaway!! following 🙂 and would LOVE to win this dolly! Subscribed and would love to have her. Our little Sally needs a sister! Thanks for the chance. i am following you! thanks for the opportunity to give emmaline a home! i also shared her on facebook. i also repinned her on pinterest. Followed!!! Absolutely in love with Emmaline!!! I have confirmed my subscription. Thank you! Public share on Facebook!!! :). Crossing my fingers! Shared on my Facebook account !! Love your dolls !!! Pinned on my Pinterest account !! Suscribed to your blog !! I would like to winn this adorable little doll !! your work is perfect !! She is amazing! Followed and of course would love a chance to win her 🙂 Off to Pin and Tweet! I just subscribed to your blog. Emmaline would make a great deployment buddy for my daughter while daddy is overseas. Shared you to all my FB friends and family. They are just as mesmerized by your dolls as I am. Have subscribed. Your doll is beautiful, btw. I just shared her on Facebook too. I subscribed and would love to win. Your dolls are amazing!!! I followed and subscribed to this and would love to win the doll she is beautifui. Pinned on my pinterest board! Now a blog subscriber! Thanks for a fun giveaway! Subscribed! would love to be entered in the draw! I have join and would like to be entered in your drawing. Your dolls are adorable!! I have subscribed and would like to enter the competition. Subscribed, shared and pinned!! Love her! She’s adorable!! Subscribed, shared and pinned! Sorry I’m not a tweeter 😦 She’s is absolutely adorable!! 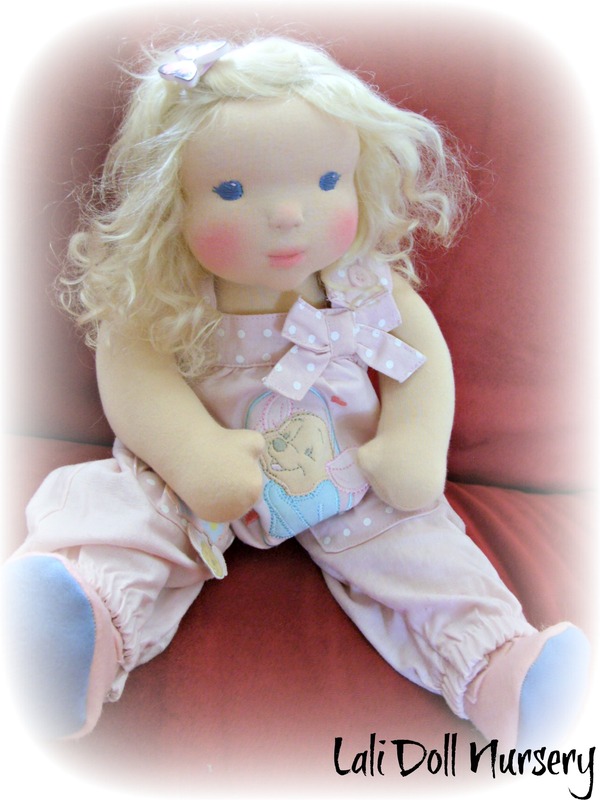 would love to be entered for a chance to win a Lali doll – thanks! I have subscribed and would like a chance to win that adorable little doll. I also shared your picture. I pinned the photo on pinterest. Hi from sweden. I just love your dolls and love to follow you and your dolls and a chance to win one. I have shared the picture of Emmaline on my facebook. Hi Jennifer! Lovely giveaway. I have followed your blog! I have shared your giveaway on my FB timeline! I subscribed to follow your blog! I have subscribed to your twitter feed! Following and shared your giveaway on my facebook timeline! Just shared a picture on my FB page! Following your blog – thank you for the chance to win such a lovely doll! Thank you so much for this chance to win her. I am subscribed and would like to enter the contest! Pinned to my Pinterest board! I am subscribed and would love to win. She is beautiful! Thanks for the chance. Just subscribed to your blog, would love to enter the contest! Shared your photo on FB. I repinned her! So gorgeous! I am subscribed and hope to win Emmaline for my real life baby doll, Kayten! Following! Would love to enter the drawing! I subscribed and would love to win this baby! I “pinned” this adorable baby! I shared this lovely on my FB page!!! subscribed and would like to be entered in the drawing!!!!! Oh, I would love to win her! ❤ Followed the blog. Also shared her photo on Facebook. followed! AND SHARED ON FB! Pinned this little beauty on to my Kaelani board for my little princess. I just subscribed. She’s gorgeous! Subscribed and would love a chance! I am subscribed and would love to be entered for this sweetie! Following and would love a new addition at our place, congrats. Wow! She’s beautiful! I am now following your blog and have my fingers tightly crossed! And lastly (because I don’t do twitter), an entry for re-pinning. Although it was no chore. I think she belongs on my boards filled with pretty things. (And on my lil cupcake’s bed, which has a few pretty things too). Hi, I have subscribed and would like to be entered in the drawing. Hey I’m following you on twitter. Chirp chirp. Yay. I just shared Emmaline’s photo on Facebook!! I pinned Emmaline on Pinterest. Woohoo. Followed. Would love a sister for Bebe!!! OK I definitely subscribed and I also shared on Facebook. Thanks for this opportunity. Your dolls are amazing. I subscribed and would like to be entered in the drawing. I shared & posted the photo of Emmaline from your facebook page. I Pined the photo of Emmaline. I subscribed to your Twitter feed. My Twitter name is @AustinaBosco. I LOVE her so much. I am keeping my fingers and toes crossed. Love these dolls! I want to win one for my niece. I am subscribed and wish to enter your comp! I ishared your Photo and subscribed also. I subscribed and would love to enter for a chance to bring precious Emmaline home!